Last Friday, I took the high road. Finally. 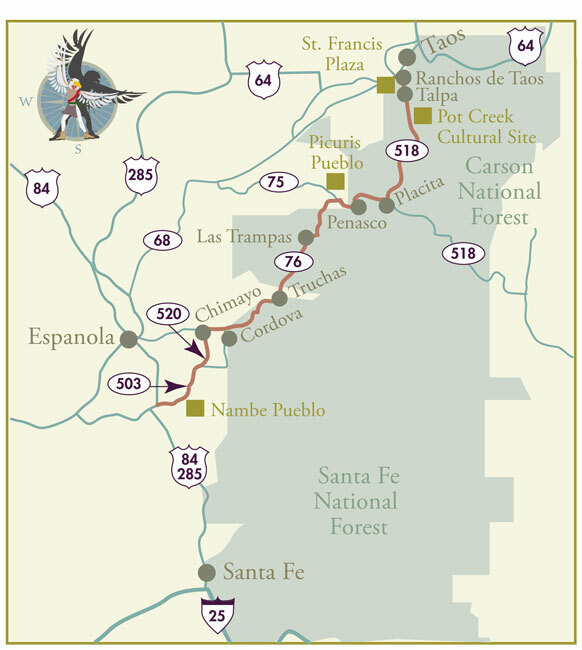 A fabled 56-mile scenic byway, the “High Road to Taos” refers to the mountainous route between Santa Fe and Taos. It winds through the Sangre de Cristo (“Blood of Christ”) Mountains, offers stunning alpine views and is dotted with centuries-old Spanish villages such as Cordova, Truchas and Penasco, to name a few. 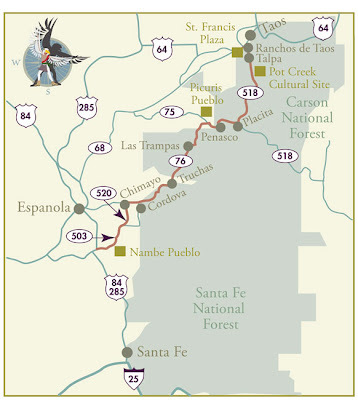 Conversely, the “Low Road” (Hwy 68) takes you through the valleys along the Rio Grande River. Both are beautiful drives, but the High Road has something that sets it apart: El Sanctuario de Chimayo. As a result, the families of these early Spanish settlers in New Mexico go back some 11 or more generations – before the country of Mexico even existed. It’s a rich history that I’m just beginning to understand, but El Sanctuario de Chimayo is certainly an excellent place to start. Built between 1811-1816 (when the area still belonged to Spain), this handmade adobe structure is said to have been built by a devout Catholic – Bernardo de Abeyta – on the site where he witnessed a miracle. Today, it contains a special room for its holy dirt, believed to have curative powers. Visitors are allowed to take a small bag of holy dirt with them. Some simply rub it on their skin. When you step outside of the holy dirt room, you find yourself in the prayer room, which is filled with symbols of suffering, healing and gratitude. 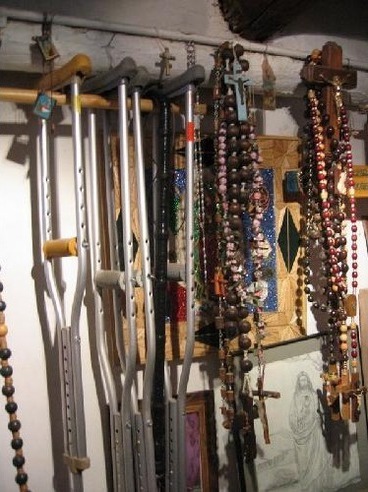 I’m talking rows and rows of crutches, casts (from broken limbs), rosaries, baby shoes and photos of military men and women. These are the tokens of the more than 300,000 annual visitors to this National Historic Landmark, some of whom make the pilgrimage by foot. This is especially common during Holy Week, when thousands of pilgrims from the US and Mexico arrive seeking miracles of healing. Many carry wooden crosses or push wheelchairs. 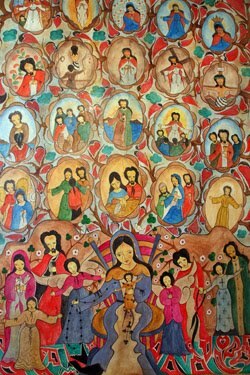 Others return in health to give thanks for having been healed previously. I’ve failed to mention the lovely, rustic sanctuary, which is filled from floor to ceiling with incredible religious and folk art, including dolls, reredos (brightly painted wooden screens) and bultos (statues). The thing that struck me most was the striking contrast between the subjects’ facial expressions– usually one of suffering or sorrow, with eyes closed or looking down – with the incredibly vivid colors used in the artwork. I felt both saddened and uplifted. Between these two amazingly ornate adobe churches and their fantastic gift shops, you could easily make an afternoon of that part alone. But there’s even more to Chimayo, including art galleries, historic weaving shops and chile vendors. I recommend stopping into Medina’s Gallery (pictured below) to chat with Carlos Medina, a talented artist and highly entertaining raconteur known as “The Chile Man.” I tried several of his chile mixes, and they were incredibly piquant. They say the best red chile comes from Chimayo – an heirloom variety known as “Capsicum annuum Chimayo,” which was once used for medicine and currency as well as seasoning – and my taste tests did not dispute this. They did, however, make me hungry. So I headed to Rancho de Chimayo, a historic restaurant with a charming terrace for outdoor dining. Once there, I ordered the carne adovada (pork marinated in red chile from Chimayo, of course), which was served with posole (hominy). It’s their signature dish, and I was expecting greatness. Sadly, it was not something I would write home about. The posole was far from spicy, and the carne adovada did not compare to the best I’ve had thus far, which was at El Bruno’s in Cuba, NM, where the pork was super tender and moist. Fortunately, I was tipped off to what may be the best food in the area a few days later. Unlike Rancho de Chimayo’s beautiful setting (see below), this humble food is served out the window of a roadside shack. I should not have been surprised. It’s the golden rule: eat with the locals, not with the tourists! Located on Route 76 between Chimayo and Espanola, the original location of El Parasol (now a family-run mini-chain with five locations in New Mexico) is everything I’ve been looking for in New Mexican cuisine. It’s delicious, addictive and cheap. For $20, we feasted on four chicken tacos, two sopapillas (fried quick bread, as shown below at Rancho de Chimayo), a tamale and a frito pie. The friend who recommended El Parasol insisted we try the chicken tacos, and I see why. They’re fresh, deep fried tortillas filled with tender shredded chicken and homemade guacamole. Add a little El Parasol salsa and…perfection. The frito pie was also a knockout thanks to the high quality beef and generous infusion of green chile, and the sopapillas were my favorite of any I’ve tried yet – huge, thick and soft. I may have used more napkins than I care to admit during the meal, but as we sat at our picnic table watching streams of locals rolling in, I knew I’d finally found the spot for crave-worthy New Mexican food. And that, I realized, is another pilgrimage completed.